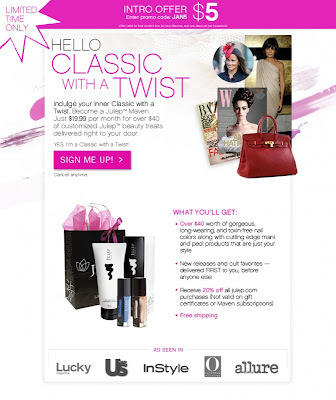 What is Julep Maven Program? If you are a fan of beauty subscription services like Birchbox, Loose Botton, and the list goes on and on, then perhaps you may be interested in Seattle-based Julep Maven's Sneak Peek Box. Basically they want to give their subscribers an insight on what it would be like as a Beauty Editor. For $19.99 plus tax a month (including shipping), Julep Maven will give you "access to the hottest trends in nail color and the latest in Mani Care and Pedi Care products - delivered right to your doorstep, just like beauty editors do." As a subscriber you get to check out the latest trends and color before they are actually released. When you create an account, they will ask you to fill out a Style Quiz to identify which Magazine beauty editor you are most comparable to. Like all product subscription services, these profiles are used to customized the products that are delivered to you. But they also let you see what products other style profiles are matched with, so they give you the opportunity to switch. Ever watched YouTube videos of subscribers unboxing products that you thought were so much better than what you received? I know I have! Having the ability to switch around before they are packed and shipped is a great option! 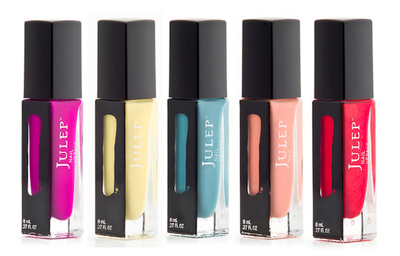 As a Julep Maven member you will receive $40 worth of nail products customized to your style profile. Each box features never before released colors. So will you be checking out the Julep Maven's Sneak Peek Box? Please let me know if the promo code (JAN5) worked for you! I think $5 is pretty great deal. Update: If the above code does not work, try MAVEN5 or WELCOMEMV or FIRST5. I signed up about a week ago so I am looking forward to receiving my first box!